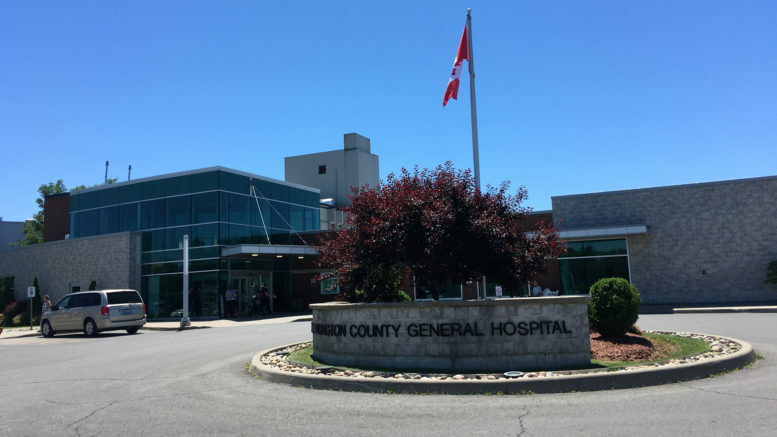 Officials at the Lennox and Addington County General Hospital (LACGH) are optimistic that through recruitment and innovation they can ease pressures on patient care in Napanee and surrounding areas. Chief of staff Dr. Kim Morrison said hospital administrators and board members “hear loud and clear that we’re in need of new physicians. She sees the impact of that need both in the facility’s operations, but also among her peers as family physicians who provide primary care to the community. Many doctors have full rosters and are not taking on new patients. Dr. Valli Hota is retiring from her practice after a career of nearly 20 years serving the community and, to date, Morrison said there isn’t a replacement confirmed. The personnel crunch affects LACGH. “We’re continually working with all the team players — the nurses, the doctors, and the community to meet those needs,” she said. Recently, Morrison indicated the hospital has had some productive talks related to recruitment and the breaking down of barriers within Ontario’s health-care system that could prove fruitful in attracting new physicians to the area. She added LACGH is fortunate a co-operative culture formed between local doctors and the hospital, coupled with its association with the residency training program at Queen’s University has made it an attractive destination. “I would be hopeful within months we would have some assistance to our human resources needs,” she said. In the meantime, the hospital continues to have dialogue with the South East Local Health Integration Network and the Ministry of Health and Long-Term Care about improved service models. Though the election of a new government has slowed some of those talks, there have been collaborative efforts locally to support primary care physicians better. That could help the community to attract and maintain doctors, but it could also bring a more effective, sustainable care model. Morrison said the community has to look at vision that brings everyone responsible for care together and puts patient needs at the centre. If they can access the care they need closer to home, that can reduce the toll on specialty services like emergency care or acute care provided at the hospital. If there are resources that can be provided to meet needs or fill gaps, then service will improve. “I’m hopeful we’re having those right conversations,” she said. Recently, the LACGH board of directors had a retreat where its members spent a fair deal of time talking about a health hub model where primary, secondary, and emergency care are still looked at as separate needs, but they can cover for one another to avoid duplication of services. Locally, Morrison said there’s a willingness to do better. The hospital’s chief administrative officer, Wayne Coveyduck, said the hub environment would bring not only physicians together, but also other medical supports and community organizations. If they can work together and even co-locate in the same facility, there are advantages to be had. In other communities that have Family Health Teams, that was mandated. The hospital has applied to the LHIN to endorse a proposal for assisted living on its campus. It is also waiting to hear where the ministry stands on a reviving a non-urgent rapid access clinic it piloted over a five-month period last year. Both could add to the integrated care model envisioned. Another development in the works is an integrated professional care team that will work in the region, governed through the Community Health Centres. Funding is in place for social workers, certified respiratory workers, dietitian, and system navigators to work directly with primary care physicians in the community. “The idea being that if you can support primary care, hopefully you don’t need as much secondary or emergency care,” Morrison said, adding the teams could address concerns like chronic diseases management and mental health. Coveyduck indicated LACGH is eager to do its part to build a better model. On the recruiting front, LACGH has found a capable physician to fill a big void. Surgeon Dr. Venkata Hota retired after 21 years and over 50,000 cases at the hospital. “That’s pretty amazing service he provided to our community and we’re thankful,” Morrison said. Dr. Jessica Andrews, a recent Queen’s surgical graduate, joined the staff this summer. Morrison said her training lends itself well to her new role at the hospital.